I've been making these muffins for a couple of months now. 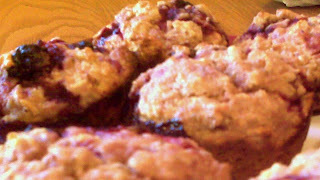 They are very healthy because they are made with whole wheat flour, oatmeal, flax seed, and wheat germ. I eat one every morning with some butter and head off to work. You know, I lost five pounds once I added breakfast to my routine! I had skipped it before. But they say you need to kick start your metabolism with breakfast and boy did it work! Luckily I had the great gift of my dad bringing down bags of frozen berries from Oregon. He gave me a pound of black currents, mulberries, and two pounds of blueberries! So of course that makes the muffins all the better. Preheat oven to 450 degrees and grease your muffin tins. In a small bowl, combine oats and buttermilk and let soak for 5-10 mins. In a big bowl, beat together oil, egg, honey. Add and combine the oatmeal mixture. In another bowl combine the remaining dry ingredients. Add them to the oatmeal mixture and stir until just combined. Fold in the berries. Spoon batter into muffin cups and bake for about 20 mins. until the muffin is set and a toothpick comes out clean. It is important to watch and not overbake because these muffins can dry out quickly.